If you recall from my last review I mentioned “half a million word monsters.” I’d now like to introduce you to one. Honestly, I don’t know how many words it’s got but it’s a BIG book with relatively small print. But, on to the break down. 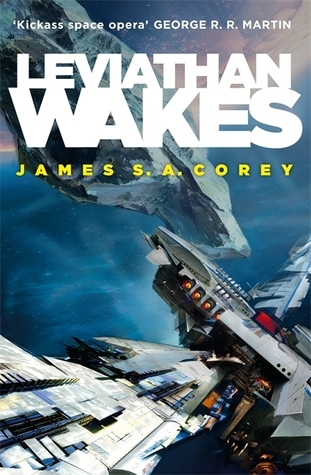 Synopsis: James “Jim” Holden is just an officer on an ice hauler until he ends up in the center of the greatest period of change in human history. On Ceres Station Josephus Miller is a corporate police officer tasked with keeping the peace as the solar system slowly unravels. Both their journeys will collide while driving humanity to the brink of all out war. Recommendation: I strongly recommend this book to mature audiences only. (Late teens or adult.) This is due to the quantity and detail of the violence. Again, the CU or Current Universe is the universe or reality in which we live. It’s set in the future (about 200 years in some sources), so technology is similarly advanced while still retaining a gritty quality. A big aspect is that humanity has yet to develop any FTL tech. Since I’m on the subject, I really like the setting in this book. It’s not an idealistic or pessimistic view of the future, just an extrapolation. Every person felt real. Every place was thought out. Every corporation sufficiently devoid of humanity while still being force to work with it. Every action had a purpose. I literally felt like I was looking into the future. James Holden was a perfect blend of arrogance and pure honesty verging on naive. His crew, however, are infinity more endearing. On the other hand I felt that Miller (I had to look his first name up for this review) was dull and boring. It was very difficult for me to stay engaged during his parts. It wasn’t that he was written poorly…..he’s just boring. The only thing I have any issue with is the role that the “Mormons” play in the series. The book doesn’t portray them in any negative way, but it feels like the authors aren’t familiar with the religion or they might have taken a different approach. There are also some other related things in some of the later books, too. Obviously I can’t say too much without giving spoilers, so I’ll have to leave it at that. Also, James S. A. Corey, the author, is a pen named used by Daniel Abraham and Ty Franck. Abraham is a distinguished author in his own right and occasionally collaborates with George R. R. Martin. Franck is actually George R. R. Martin’s assistant and originally began The Expanse as a table top role-playing game. This close association with Martin is evident in the tone and rhythm of this book and the series as a whole. In summary, I really like this book and the series and feel that you might too, especially Holden’s crew. Currently I’ve read through book 4, with book 5 sitting on the shelf waiting to be opened. In prepping for this review I actually discovered there are a few novellas too which I’m going to go find now and book 6 should drop sometime in 2016. P.S. They are making a TV series based on this series called The Expanse (obviously) and it will be deputing on Syfy channel December 14, 2015.